Party Ideas by Mardi Gras Outlet: Work Wreath works miracles for crafters! A work wreath is a blessing for those of us who love to create unique wreaths, but do not have time to spend hours making a wreath. This 24" work wreath is basically a wire wreath form with 36 pre-attached metallic wire tips. The wire tips can be used to quickly attach poly deco mesh garland, ribbon, floral sprays or ornaments to the wreath form, creating your own one-of-a-kind wreath. It is creative and easy! This impressive wreath was created in as little as 10 minutes! For a tutorial on creating this fantastic Mardi Gras wreath, watch this video below. You will be amazed to see how easy it is to create this Mardi Gras Deco Mesh Wreath. Simply wire the 21" deco mesh garland around the wreath form twice and the wreath is finished. 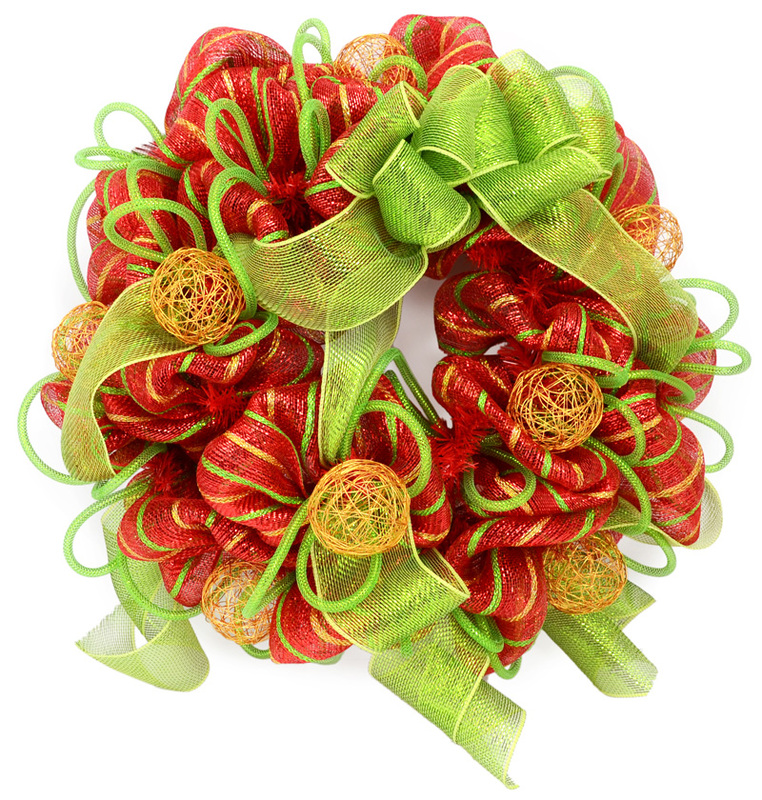 The wreath shown here is filled with our 21" wide deco mesh garland (in the Mardi Gras Deluxe Pattern). You could also combine two or more colors or patterns for a designer wreath look with a low cost! This deco mesh wreath looks fantastic with just the poly deco mesh garland, but you could also add other accents to it. Using the pre-attached wire tips, layer in coordinating ribbon, Mardi Gras masks, floral sprays or colored balls. The possibilities are endless for the combinations you can create. Both the poly deco mesh garland and wire wreath form are weatherproof and durable, making them perfect for outdoor use. Unlike traditional sinamay, which is a natural product, this poly deco mesh is resilient against heat and humidity. This work wreath comes in a variety of colors to match your school colors, party theme or holiday. These are just a few examples of the wreaths you can create. A similar version of the work wreath is available as a work garland form. Click the links below, to see available colors and styles in all of these products that coordinate with this wreath form. Create something unique with one of these fun work wreath forms! Share your creative ideas with us at ideas@mardigrasoutlet.com. We now have several more video tutorials to help you make Christmas wreaths, garlands, bows, wall trees and even how to decorate your Christmas tree with deco mesh. Glad you liked the wreath tutorial!